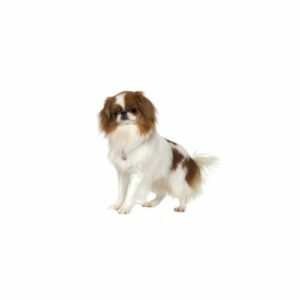 The Japanese Chin’s origin and development in its native land of China is wrapped in royalty and adoration. They were bred for the sole purpose of accompanying the ladies of the Imperial Palace and warming the laps of Chinese aristocracy. There are illustrations on ancient pottery and embroideries that are centuries old, and evidence suggests that one could not purchase a Chin they were kept in the hands of the nobility and frequently given as gifts of esteem to diplomats and to foreigners who rendered some outstanding service to Japan.